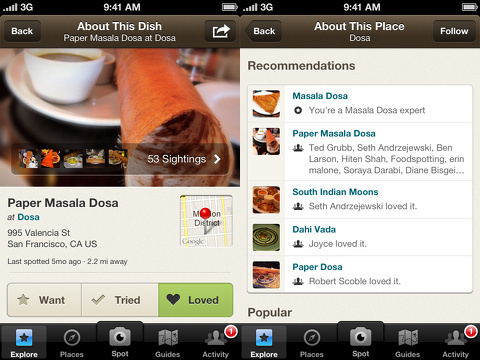 The Foodspotting social networking app helps you find the best dishes and restaurants with your iPhone. With inspiration from Pinterest and Tumblr, the Foodspotting iPhone app relies on photos and feedback provided by the Foodspotting foodies, curated guides by respected food publications and bloggers, and content related to your location. The home screen of the Foodspotting iPhone app is visually appealing and organized well. The top menu bar has two icons. With a touch on the icon in the top left corner, you can enter a manual search. The icon in the top right corner allows you to use your current location or choose another location. This is a great tool for traveling, so you can research and plan around a physical address. It is sometimes confusing to search for restaurants in an unfamiliar city, since you don’t know neighborhoods. A location filter for restaurants is a great tool. Just below the top menu bar is a green bar that allows you to filter your feeds. You can check out photos of dishes, restaurants, and feedback by the following categories: specials, best, nearby, latest, following, wanted, tried, and loved. The feed is navigated with horizontal finger swipes. For each dish, there is a nice photo, name of the dish, restaurant’s name, location, number of likes, and distance. There is an x icon on the left side of the photo, so you can delete a dish or location from your feed. You can also touch the heart on the right side of the photo to log a like. When you touch a photo of a dish, the photo fills the screen completely. Additional images from the restaurant form a banner at the bottom of the photo. With a vertical swipe up the screen, a list of pertinent items about the restaurant appears. You can find the contact information for the restaurant. A neat touch is the ability to add the dish to your want, tried, and loved feeds. You can check out reviews, find the restaurant on Yelp, and get directions. 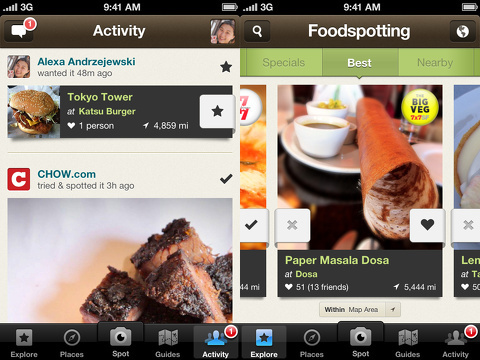 If you want to showcase your favorite dishes, you can add them to the Foodspotting iPhone app with cool interface. You touch the spot icon at the bottom of the screen, and, like Path’s great halo of options, four circle icons form a rainbow in the lower portion of the screen. You can use an existing photo, use the in-app camera, shoot a photo with Camera+ iPhone app, and tag the location with a touch on one of the icons. Additional neat features of the Foodspotting iPhone app are the curated guides and activity feed. The curated guides are based around your location, and they are produced by esteemed food publications like Food & Wine and the James Beard Foundation. Your activity feed is best, when you create an account with your email or Facebook authorization. The feed contains the strong visual presence, but adds comments, likes, and social engagement content in a style similar to Tumblr. If you have grown weary of creating yet another social networking account, you can access the majority of the content without an account. The Foodspotting iPhone app is a fun filter for all of the food and restaurant iOS apps, so you can find the best dish at a restaurant that suits your mood and tastes. AppSafari review of Foodspotting was written by Jenni Ward on March 12th, 2013 and categorized under App Store, Food, Free, Travel. Page viewed 5952 times, 1 so far today. Need help on using these apps? Please read the Help Page. I really LOVE this app! While I know the foodie space is crowded in the app store, this one stands out for me as the top in the field! Thank you for share this with us on your blog.